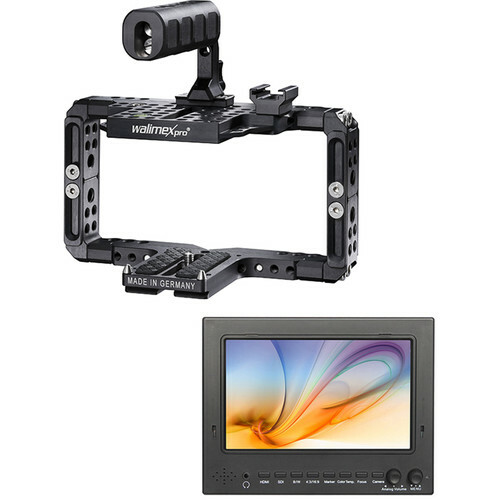 This 7" ST702 3G-SDI & HDMI Field Monitor Kit with Universal Frame is assembled by B&H to provide you with a 7" field monitor and an adjustable universal cage to protect it from the rigors of production. The monitor supports video signals over 3G-SDI and HDMI, making it suitable for virtually any SD/HD video workflow. The monitor's camera assist tools include the focus aid peaking, as well as image freeze and image flip. You can also activate the center screen marker, a popular function, as well as screen markers that aid you by displaying the aspect ratio you are recording. Although intended for cameras, the walimex Pro Aptaris Universal Frame is height and width-adjustable, which makes it suitable for use as a monitor cage. The solid construction protects the monitor, while the removable top handle can be oriented forward or back, providing a secure way of carrying your monitor. The 1/4"-20 and 3/8"-16 threaded mounting enables you to mount accessories for your monitor without stressing the monitor's chassis. Taking advantage of the frame's mounting holes allows you to mount it to a stand or QR plate, providing you with many options.